March in Tokyo holds all the promise of spring tucked in and around the bluster of winter winds. Like elsewhere, all four seasons seem to be present this month in bloom, fruit, and vegetable. One of the best ways to savor the last tastes of winter and satisfy the anticipation of spring flavors is a visit to one of the many local farmers markets around the city. There are heaps all month long and often on both Saturday and Sunday. Plenty of opportunity to get out and explore and find a new favorite taste! Photo Note: Kimiko Matsubara of Cocoi with some of her nifty environmentally friendly cleaning products at the Earth Day Market in January. A new event with nearly 30 growers and producers offering up useful, tasty, and interesting items for the shoppers delight. Two days (yup, two days!) of opportunity all in beautiful Inokashira Park. Jet lag or no jet lag, I'll be there! 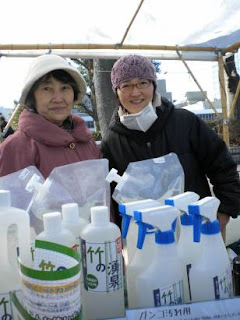 *I remain hopeful that some of our Mitaka growers will move in and strut their stuff.